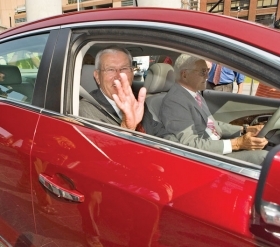 GM newcomer Ed Whitacre is riding shotgun here, but back at the office he's in the driver's seat -- and he's counting on Bob Lutz, right, to help. Like peanut butter and jelly or Rocky and Bullwinkle, sales and marketing just go together. That’s why General Motors CEO Ed Whitacre says he took marketing from Vice Chairman Bob Lutz’s todo list and put it under new sales boss Susan Docherty. “No personalities, no nothing involved,” he told reporters last week. Taking away Lutz’s responsibilities for marketing and communication and making him an adviser on product development was one of the chairman’s first moves as GM’s interim CEO, a position he assumed Dec. 1 when CEO Fritz Henderson was ousted.